Franchising serves as a popular strategy for internationalizing a business. Essentially, franchising is a special form of "licensing". It allows the licensor more control over the licensee and provides support from the licensor to the licensee. International franchising is one of the fastest-growing forms of international business activity today. Under a franchising agreement an independent entrepreneur or organization, called the franchisee, is allowed to operate a business under the name of another, called franchisor, in return for a fee. The franchisor provides trademarks, operating systems, and well-known product or service reputations, as well as continuous support system as advertising, training, reservation services (for hotel and restaurant operations), and quality assurance programs to its franchisees. 1. Considerable success in franchising has already been achieved by the franchisor in its domestic market. For instance, prior to building of its restaurants abroad, McDonald's, Burger King, Kentucky Fried Chicken (KFC), etc already had hundreds of franchised restaurants in the United States. 2. The firms has been successful domestically due to its unique product propositions and advantages operating procedures along with necessary operational systems. The initial success of any big brand franchisee is generally the outcome of its consistent and popular menu, quick and efficient service along with quality. 3. Domestic success factors should be transferable to foreign locations. In the case of KFC, the popularity of "American" food recipes in the other countries, value given to efficiency and lower prices by consumers worldwide, and on top of that, the desire among foreign tourists to the United States to visit a KFC restaurant, have been instrumental in its success. 4. There must be foreign investors who are interested in entering into franchise agreements with principal brand owners, which is not a problem for a well-established franchisors. 1. Based on the franchisee's sales, the franchisor receives a fixed payment plus a royalty for the rights available to the franchisee to use the franchisor's brand name, product line, product recipes (in case of food chains), and operating procedures. 2. The franchisee agrees to adhere to the franchiser's requirements regarding physical store appearance, financial reporting, and operating procedures. Franchisors, however, are likely to allow some degree of flexibility in order to meet local customs and tastes (including pallete taste). Similar to other licensing arrangements, one of the services offered to the franchisor by the franchisee is knowledge about the local marker dynamics. For instance, globally, McDonald's restaurants sell beef meat under the cheese burger product category while in India, only chicken is sold, complying with Hindu cultural norms. 3. The franchisor assists the franchisee in establishing the new business, and also provides expertise advertising (both physical and digital) and usually able to negotiate favorable arrangements with suppliers. Since franchising is more common in the United States than in other countries, U.S. principal brand owners are among the leaders in international franchising. Fast food firms such as McDonald's Domino's Pizza Hut and KFC, which have franchised restaurants worldwide, are some leading examples. Along with these, hotel chains such as Hilton, Marriot and rental car firms such as Hertz, and Avis have made considerable mark by developing major presence worldwide. A number of non-U.S. firms too, have been successful in franchising, For instance, Accors SA's chain of Ibis, Softel, Novotel and Etap hotels are spread across the Europe. The Italian clothing retailer., Benetton, has franchised outlets in several countries. The British firm, Allied Lyons PLC, owns and franchises Baskin-Robbins 31 flavors and Dunkin's Donuts. The Japanese firm, Bridgestone Corporation deployed retail outlets of both Bridgestone and Firestone tyres in the United States as well as many other countries. 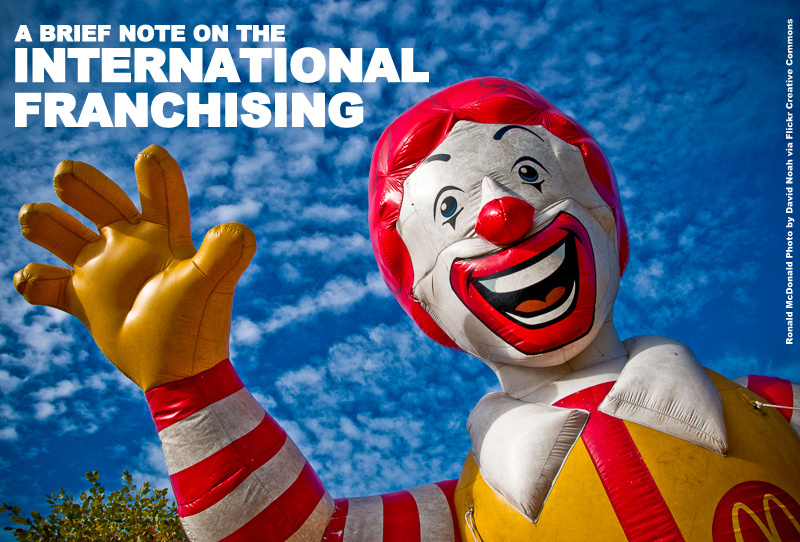 There are both advantages and disadvantages in international franchising. On one hand, franchisees can enter a business that has an established and proven product and operating system. Franchisors can expand internationally with relatively low risk and cost. Also, it is possible for the franchisor to obtain critical information about local market from the host country entrepreneurs. Such information might be otherwise difficult to obtain. Further, the franchisor can learn valuable lessons from franchisee that apply to the host country as well as many others. For example, although McDonald's management in the U.S. believed that the firm's restaurants would be successful only if they were operating from free-standing entities located in suburbs and smaller towns, they were later convinced by a Japanese franchisee to allow them to open chains in inner-city office buildings, which quickly became one of the firm's most popular restaurants in downtown locations at many U.S. cities, a direct outcome of the insight of its Japanese franchisee. On the other hand, just as with licensing both parties to a franchising agreement have to share the profits earned at the franchised location. Also, compared to domestic franchising, international franchising may be much more complicated due to implementation of sub-franchising by the franchisee itself and complying with host country's sourcing obligations. Becoming an area developer for a territory within the host country is another means of rapid expansion and but has its own concerns. In the present era of globalization, it is very essential to understand the nuances of international franchising along with their advantages and disadvantages. Thus, a franchisee must carefully negotiate the license and must develop a marketing or business plan in sync with franchisor's long term vision and mission. During the negotiation, the fees must be fully disclosed and there should not be any hidden fees. The start-up costs and working capital must be known before the license is granted. Also, there must be assurance that additional licensees will not crowd the "territory" if the franchise is worked according to plan. In any given scenario, once the agreement is enforced, the franchisee must be seen as an independent merchant and should be treated as an indispensable "business partner" through out the duration of contract.